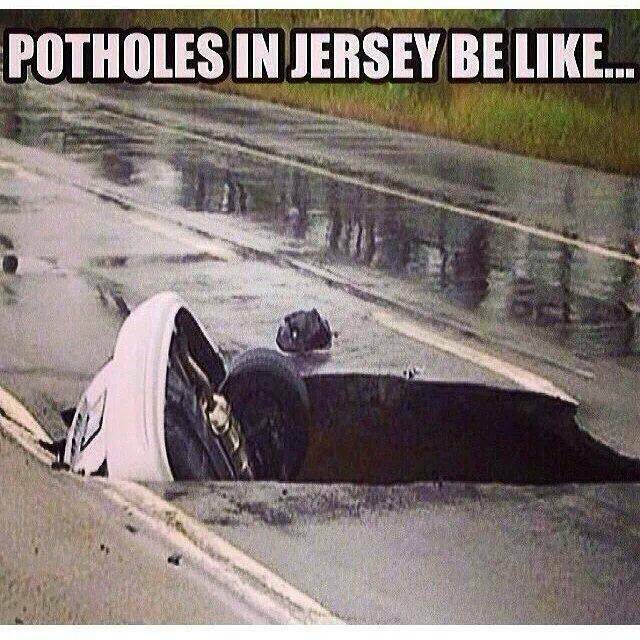 Potholes in New Jersey is a better harbinger of spring than robins, than croci, than those marshmallow peeps poppin’ up at the corner grocery. Those pervasive little asphalt assassins never fail to creep up on you around every bend and over every hillock, disguised like shimmering little macadam birdbaths until you hit one and bam! there goes the hub cap, spinning away like a frisbee. On my way home tonight I counted no less than thirty-seven of the replicating little suckers. And that didn’t include the ever-widening fissures that form due to the expansion from the left-side/right-side paving, the winter erosion of the softer shoulder, the gully driveways develop as it cracks away from the road and of course, the always wonderful frost heaves. And that was just on my side of the road. Which, oddly enough, quickly becomes your side when you swerve into my lane to avoid them. But if all this isn’t bad enough, the cure isn’t much better. How many of you have driven smack into a fresh pancake of cold patch, that municipal quick-fix of asphalt the town boys tamp down with shovels and their own boots, to shut up the one irate taxpayer that doesn’t quit calling until it’s fixed. Ahh…the lovely ping-ping-ping of loose tar as it plies itself to the undercarriage of your car. You’ll be scrubbing that off until nigh on August. Soon those road patch patties will be as ubiquitous as dandelions, and just as hard to get rid of. Because if you’re betting on highway dollars on high to get them gone, you can just forget it. The bank is broke, and staying that way for a while.